Ankle sprain treatment is required anytime an ankle injury occurs by twisting or rolling the ankle to the point of damaging the ligaments that hold the bones in place. Causes for ankle injury can range from playing sports and forcefully rolling the ankle when running, to simply taking a walk in the park and twisting the ankle when stepping down from a curb. Rolled ankle injury happens to everyone at least once during their lifetime, and treatment helps with healing the injured ligaments faster. Soccer players will injure their ankle often, due to the nature of the game with sudden change of speed, turns, jumps and contact from other players. Knowing how to treat a sprained ankle, and taking the time to do so, is a MUST for every athlete who wants to return to playing as soon as possible after an ankle injury happens. Injured ankle recovery time can take up to 3 months, depending on the severity and grade of the ankle sprain. Grade I Ankle Sprain Treatment is 1 - 2 weeks. Grade II Ankle Sprain Treatment is 4 - 6 weeks. Grade III Ankle Sprain Treatment is 8 - 12 weeks. Every ankle injury treatment should start with protecting the sprained ankle. This part is often overlooked by many people. After an injury happens, simply wearing an ankle support brace when walking will help with putting less pressure on the injured ankle ligaments. RICE treatment is known as Rest - Ice - Compress - Elevate. This is the best form of treatment for an injured ankle that does not require surgery. Rice method should be applied right away after an injury occurs. Doing so will help with reducing the swelling and pain in the injured ankle area. Avoid putting weight on the injured ankle, especially during the first few days after the injury. Avoid trying to play or train through pain no matter how mild it feels. Swimming or cycling is the best way to exercise without putting much pressure on the injured ankle ligaments. Taking the time to properly heal after an ankle injury is crucial in avoiding long term ankle problems, and frequent ankle injuries. 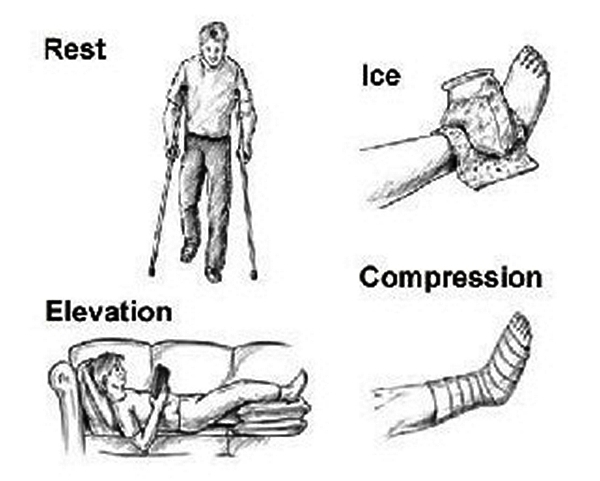 Apply Ice on the injured ankle for a maximum of 20 minutes at a time, with 2-4 hours in between. Ice will help reduce pain, swelling, redness and warmth in the ankle. Applying ice right after the ankle injury occurs will prevent much of the inflammation from developing, and is the best way to start treatment early. Avoid putting ice directly over the skin. Instead wear a soccer sock, and apply ice over the sock, or in a similar manner. Compressing or strapping the ankle will provide support to the injured ankle ligaments, and help with inflammation. Elastic ACE ankle wrap, or a similar ankle support brace, is a cheap and effective way to go. With any serious injury, doctor should be consulted to establish the full extent of the injury and treatment that will follow. Avoid applying the wraps too tight, wrapping the ankle too tight may disrupt the blood flow to the ankle. The last step in RICE treatment is Elevating the ankle above heart level. Elevating the ankle above heart level will help reduce pain and swelling, by letting more blood circulate and repair the injured ankle tissue. Use of anti inflammatory medication, such as Ibuprofen, will help with swelling and pain as well. Use of several pillows to prop the leg up, and lift the ankle above heart level is an easy option. Sea Salt can be found in any grocery store. Sea Salt is used as a natural remedy to help with healing the injured ligaments. Soaking the injured ankle in a bucket of water, mixed with Sea Salt, helps reduce the recovery time. Soak the ankle for 30 minutes. Repeat as time allows. This Sea Salt treatment also feels good and can be done while watching tv, playing videogames or doing homework. Start performing ankle exercises to return strength and mobility to the injured ankle. Strengthening exercises should be done when the swelling is greatly reduced. Writing the alphabet letters with the injured foot is a great ankle exercise for returning strength and mobility to the injured ankle. If the injury does not feel better after 1 - 2 weeks of ankle sprain treatment, consulting a Doctor is a MUST. For more information on Ankle Sprain Recovery visit Physical Therapy for Ankle Injury.